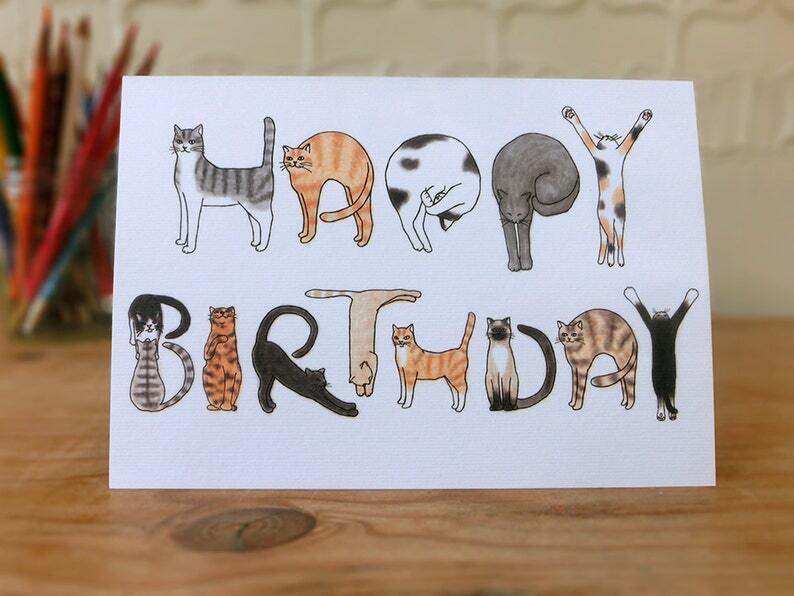 Perfect card to say "Happy Birthday" for the cat lover! ・Based on my original illustration and professionally printed in the UK. ・Blank inside for your own message. This card is printed on 280gsm slightly textured paper and comes with recycled brown envelope in a cellophane bag. It will be delivered in a hardbacked envelop. Cats "Thank you" greeting card. Lovely card for a cat lover :) Thank you! Items will not be shipped until I receive notification of the payment being successfully made. Please make your payment within 3days of purchasing an item, otherwise the transaction may be cancelled. Hopefully you will love all Items you buy from Ginger Striped Patch. However, if you receive your item and are not entirely satisfied with it, please contact me straight away and I will do my best to resolve the issue. International delivery is by Royal Mail International Standerd. Shipping upgrade or additional requirements are available on request. Please note shipping upgrade will result in additional fees.